The proliferation of social media has allowed online users to flood the Internet daily with interesting things to share. Facebook likes and shares, Twitter retweets, Google+ +1’s, Pinterest repins – these features show how people have become accustomed to sharing something noteworthy. For some social media marketers, sharing posts to inform people has become a daunting task that requires help from their followers and subscribers. Receiving likes, shares, retweets, +1’s, repins, and other sharing features is gradually becoming elusive and subtle, and even seem impossible at times. John Bell, Global Managing Director of Social@Ogilvy, said most brands know how hard it is to make content that will help their business and trigger a sharing craze. He said brand content recommended or shared by friends, colleagues, and online acquaintances matters more. When a post catches the attention of a reader, a part of his or her brain, impressed by or empathizing with the post, will make him or her share it with friends and family. But how do marketers create this content and urge people to shrae it across social media platforms? Marketers who want to create engaging, shareable, relevant content for a brand have to follow some principles. 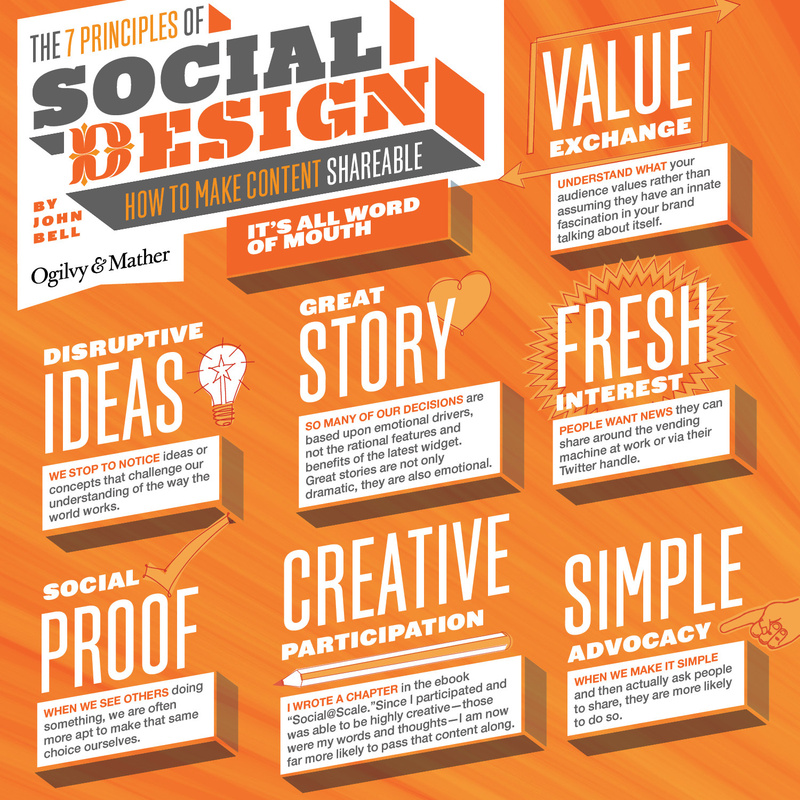 In line with this, Bell listed 7 principles of social design about how to create engaging content that people would want to share. Think of a status update that is interesting and relevant to the brand and to your fans and followers. You have to mull over each post, take a step back, and consider the interests of your subscribers. Also, monitor and try to find the things that will trigger their emotions and give them value. Posts that stimulate ideas and deeper meanings on how things work will catch attention. People may even share their thoughts about it. A noteworthy story not only tells its intellectual aspects, but it also sparks passion. Always think of new stuff to share, read the news about the industry you are in, and follow the hottest trends from social networking sites. People want fresh ideas and interesting content. People now, due to the digital age, have the tendency to follow trends. They are more inclined to repeat or imitate what others did before them. Allowing people to interact creatively in creating content will stimulate them to share more. One of the most overlooked advices give to marketers is to ask fans to share content. Do not be afraid to ask your followers to do share your content. A simple request will not hurt, but it increases your chance to get the sharing frenzy to work. What are your ideas about these social design principles? Will it work or not? Drop us a comment below.